This spiky green plant is a snap to grow indoors, and has countless healing properties and uses around the house. 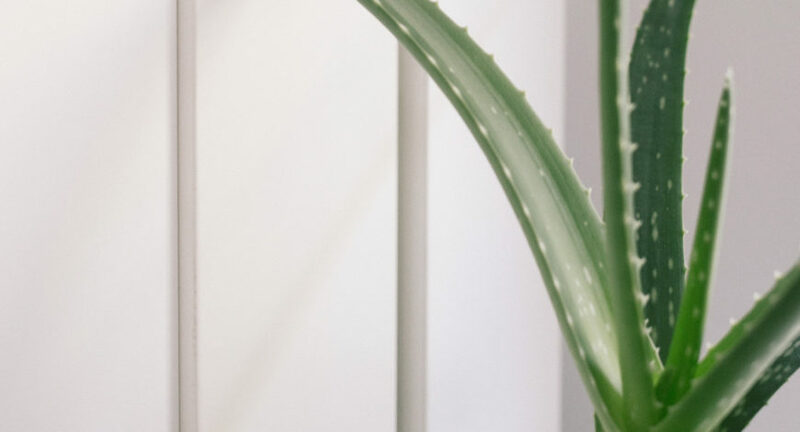 Aloe vera may be the most commonly used herbal remedy in the U.S., and it’s simple to grow it for yourself instead of running out to buy it to treat a sunburn, soothe your skin, or even mix into a detox drink. Aloe vera juice is jack of all trades: it’s good for burns and many skin conditions; it works as hair conditioner, styling gel, or for a doing your own non-toxic blow-out; and many people swear by it as liquid tonic when your diet needs a refresh. In fact, our test kitchen just whipped up some pretty amazing recipes. As for the origins of this versatile plant, aloe vera probably originated in Africa, but it is so useful (the earliest written record of its use dates from more than two centuries B.C.) and adaptable that it can now be found growing wild in just about every tropical region around the world. If you don’t live in the tropics, an aloe vera plant is easy to grow indoors as a house plant, so you can always have it on hand. It’s common and easy to find at your local garden store, and they tend to make babies, so if you know anyone with a plant they can probably give you a start or two. Here’s our guide to growing aloe vera at home. Soil: Aloe vera needs well-drained, sandy potting soil. Mix half sand and half potting soil or buy an organic cacti and succulent mix. Containers: Unglazed clay (terra cotta) pots are ideal, as they allow the soil to dry faster than plastic or glazed pots do. Be sure other types of container have multiple drainage holes in their bottom. Select a container that is just large enough for the roots (and to support the weight of the leaves without tipping over). Light: Bright, sunny conditions are ideal, though aloe vera will put up with just a little sunlight (in very low light conditions, plants may go dormant and will stop growing until light levels increase). Water: Aloe vera is a dryland plant. Water heavily, then allow the potting mix to dry completely before watering again. This means only watering about every two weeks or even less frequently, especially in the winter or in low light locations when the plant is nearly dormant. Don’t water a little every day or so, or try to keep the soil moist, because you will rot out its roots. Limp or brown leaves are often a symptom of overwaterering. You can move potted aloe veras outdoors during the summer. To prevent overexposure to the sun, put them in a shady location (even under a chair or table will work) at first and move them a little every few days until they are in full sun all day long.